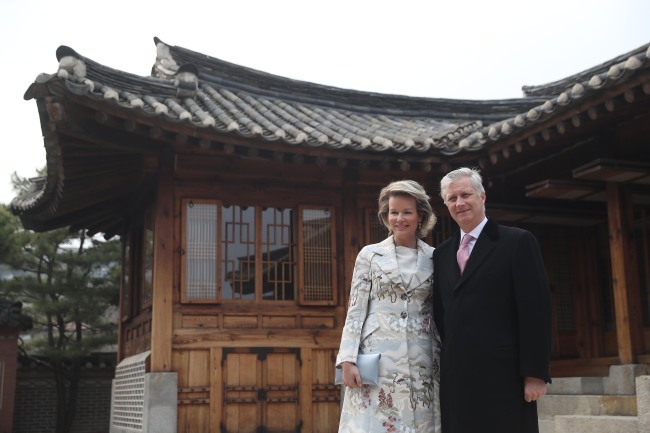 King Philippe of Belgium and his wife Queen Mathilde kicked off their four-day state visit to South Korea on Monday, aimed at boost economic cooperation and cultural ties between the two countries. President Moon Jae-in and King Philippe Leopold Louis Marie will discuss ways to deepen substantive cooperation in diplomatic relations and expand business collaborations, especially in the information and communication technology, chemicals, logistics and food industries. The Belgian king had visited South Korea three times -- in 1993, 2000 and 2009 -- as the head of an economic delegation during his reign as prince before he was crowned king in 2013. Accompanied by a delegation of some 200 people, including senior officials from the Ministry of Foreign Affairs and business leaders, King Philippe is to attend a seminar on smart city and a Korea-Belgium business forum. On Monday, the royal couple visited the Korea Furniture Museum in Seoul, which houses more than 2,000 traditional furniture pieces and 10 hanok, or traditional Korean houses. A ceremonial welcome and an official banquet will be held at Cheong Wa Dae on Tuesday, where the two leaders will share Belgium’s experience on integration into the European Union and its central role in the process of peace settlement in the region. Moon will seek support from the European country, currently a nonpermanent member of the UN Security Council, for South Korea’s ongoing efforts in the inter-Korean peace process. King Philippe and Queen Mathilde will lay a wreath at the National Cemetery and pay tribute to fallen Korean and Belgian soldiers who died in the Korean War. Over 100 Belgian military members died in the 1950-1953 Korean War.